Park View Road is home to Conference National semi-professional football club Welling United, and was the ground of their predecessors Bexley United. 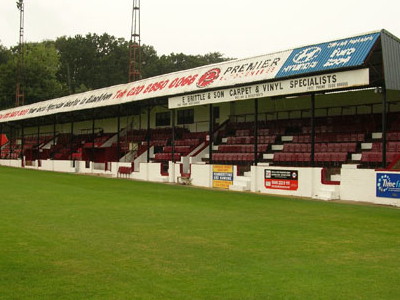 Welling have played there since 1977. It is also the home of Erith & Belvedere who have been ground sharing since the 1999 season. The ground takes its name from a section of the A207 road in Welling, London, immediately adjacent to Danson Park. It is not truly known when football was first played at Park View Road, but a significant grandstand was built by the late 1930s. It suffered substantial damage during The Blitz of World War II and lay derelict for some years after. This was until a campaign was initiated to reform Bexleyheath & Welling F.C. Crowds soon soared to over 2,000. Here's the our members favorite photos of "Sporting Areas in London". Upload your photo of Park View Road!